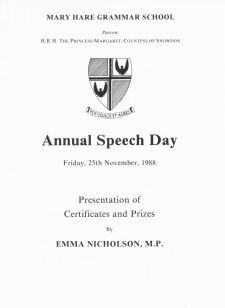 Programme for Annual Speech Day, Friday 25 November 1988. The Chairman of the Board of Governors will preside and ask the Principal to present his Report for the year 1987-1988. The Chairman will invite Emma Nicholson to present prizes and address the meeting. A Governor will propose a vote of thanks to the Guest of Honour. Avril Hepner, the Head Girl, will propose a vote of thanks to the Chairman and the Governors.